All photos by Xian Warner. At 4:30pm on Friday 20th July, a flock of doves was released into the warm afternoon sky, as nuns’ white habits billowed in tune with the rainbow flags around them, and a prayer officially launched Pride Timor-Leste 2018. It was no coincidence that one of the hashtags for the event was #MarsaBaDiversidade, or, March for Diversity. A representative from the Asosiasaun Defisiénsia Timor-Leste (Timor-Leste Disabled People’s Association) made opening remarks from a rainbow float, under the shade of the beachfront coconut palms. From the back of the crowd, bedecked in black lace, with knee-high boots and hip-length curls, the band leader from CODIVA, a local transgender health NGO, bolted through the crowd. With an impressive spin of her silver staff, she commanded the 20+ piece marching band to get the party started. And what a party it was! The 2018 Timor-Leste Pride Parade encompassed so much of what I love about this country. The coming together of people from such different walks of life, the seeming contradictions that somehow flow around each other like water so as to coexist smoothly, the hard memories of the past that give strength to the energetic enthusiasm of wanting to make the future of the nation better. And the way that music is a thread that ties it all together. The marching band held the beat at front, while musicians, including Black Jesuz and Joviana Guterres, got the back half of the crowd dancing to the tunes booming from the float. Only when passing the Motael Church was the volume lowered – out of respect (to carve out a new social space requires flexibility). 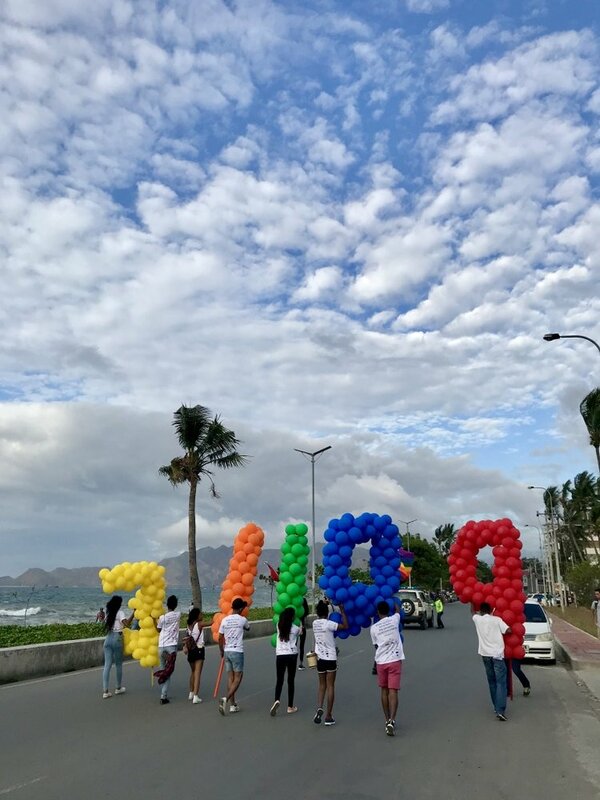 At one point during the hour and a half long march, one section of the crowd cheered on an acrobatic capoeira performance in front of Dili’s port. 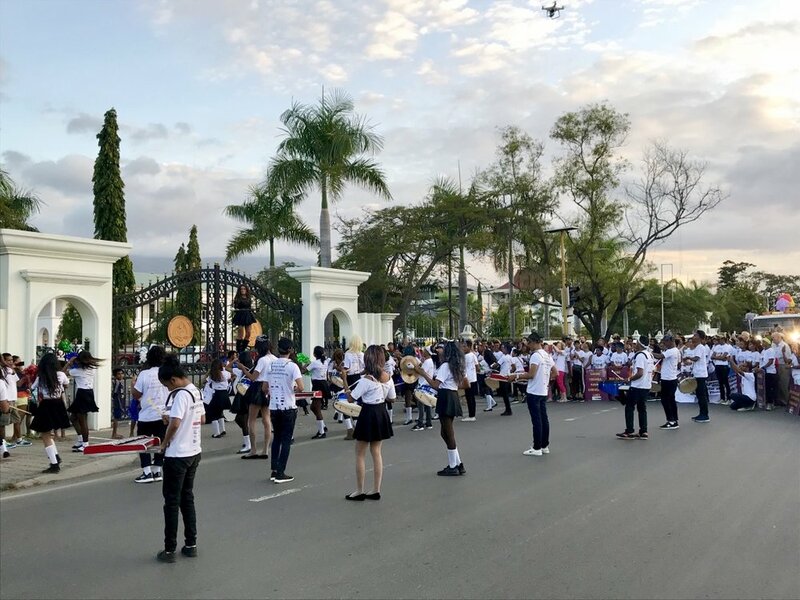 Another section, further down the road, watched in awe as the stilettoed transgender band leader climbed atop a carefully-balanced pile of drums in front of the gates of the Government Palace to conduct the band’s rendition of ‘Lambada,’ as if playing to the heads of State. Not everyone has been so supportive, however. Within a few hours, public Facebook posts about the event had already received aggressive, homophobic comments. 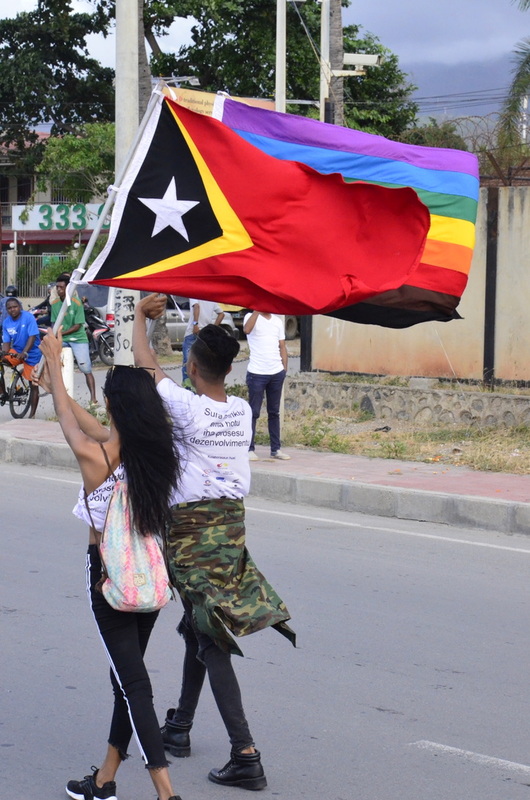 Natalino Ornai Guterres, of Hatutan, the volunteer-led youth organisation coordinating the Pride festivities together with CODIVA and Arco Iris, explained to me that discrimination and violence continue to be daily realities for LGBTI people in Timor-Leste. This treatment, he described, holds young Timorese LGBTI kids back from achieving their best at school, which, in turn, reduces their longer-term employment opportunities. Recent research also confirms very severe forms of violence based on sexual orientation and gender identity exist in Timor-Leste. One of the authors of this research, renowned lesbian activist, co-founder of Arco Iris, and environmental educator, Bella Galhos, said, “Many Timorese think that the idea of LGBTI was imported from overseas. But we were born in Timor, we live in Timor. And we were born this way.” In response to these ongoing challenges and discrimination, this year Hatutan is maintaining its focus on three priority areas: increasing acceptance at home, reducing bullying in schools, and addressing street harassment. As the sun set over the nation’s second Pride parade, a dance troupe, in traditional Timorese tais costumes, performed over a rainbow carpet and a group of young musicians played a beloved old Timorese song, while the crowd swayed along in unison. The message, strung together by musical chords, felt clear: Timorese culture and diversity acceptance are not mutually exclusive. They can, and in many cases do, co-exist in harmony. When I asked Natalino Guterres what message he’d like to share with our readers, he said, “Come to our Pride celebrations next year – see how we do it in Timor.” I promise you, you won’t regret it.